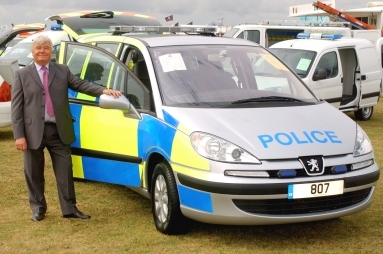 Peugeot Specialist Vehicle Operations (PSVO) exhibited a fully equipped and Police liveried 807 for the first time at this year’s Police Fleet Manager’s Show at Wroughton, near Swindon, to help celebrate the 30th anniversary of the show. The 807 was fitted with specialist racking, in this case suitable for use by accident investigation officers. However, despite the seats being removed to accommodate the racking, no location holes were drilled, allowing the vehicle to be easily returned to its original condition and easier to sell on – an important consideration for today’s fleet managers/operators. PSVO also displayed the versatile Peugeot 307 Estate, adapted to carry two police dogs in a special lightweight dog cage. This was of particular interest because of the ease of loading and unloading, helping to ensure a quick start for the dog response unit. A semi-acoustic bulkhead to suppress any noise of the dogs and to improve conditions for police drivers was also demonstrated. The Expert van, which is capable of transporting two prisoners, was also a good example of how Peugeot is addressing the demand for fuel and CO2 efficient vehicles from police forces across the country. It also met the theme of this year’s show – ‘Police, Transporting the Future’ – by reflecting the importance of protecting the planet, both now and in future years. Jon Morton, fleet sales manager at PSVO said: "Our range of vehicles was very well received, with a lot of interest in the 807, 307 Estate dog carrier and new Expert cell van, in particular. We are able to adapt any of our vehicles to meet any police/emergency service need whilst at the same time adhering to strict safety standards." Description: Jon Morton fleet sales manager for Peugeot Specialist Vehicle Operations (PSVO) with the fully equipped and police liveried 807 at this year's Police Fleet Manager's Show at Wroughton.